After their TV appearance on Jamie and Jimmy's Friday Night Feast on Channel 4 recently, where they focused on their Wild Squirrel pie (which we went nuts for when we rated it back in January 2014) we couldn’t resist trying a few more Nice Pies this British Pie Week, with these two eaten on Day Two! As part of our “How long can we just eat pie for?” Pieathon challenge we thought we’d benefit from a range of their smaller pies, which coming in at £3.50 is pretty reasonable for a hefty, meat filled pie packed with delicious filling and cooked in their lovely butter shortcrust pastry. As I’ve mentioned before many a time with these Nice Pies (for which you can see a full list of all the previous Nice Pies we've rated here), it is amazing how they hold together so well despite being so filled with content. The nature of the pastry means it can be a little crumbly in places but in general it is very nice and lovely and golden once cooked. The Red Stag Pie was, as is a feature in all the Nice Pie range, once again full of succulent and tender meat. It’s quite incredible the meat capacity in these pies, with 70% venison making it one of the most meat-filled game pies we’ve had. The gravy was near perfect consistency, with a lovely moisture yet not too runny – perfect so you could pick the pie up in your hand and enjoy it! 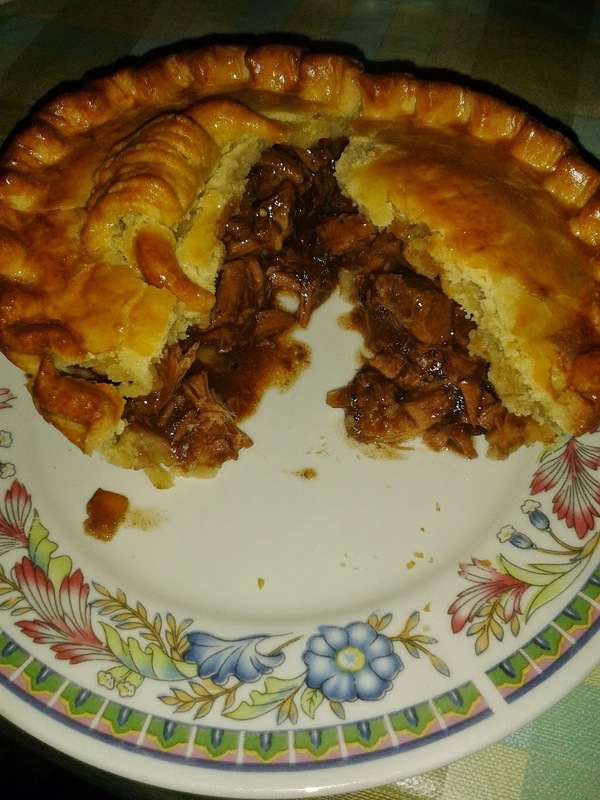 The flavours worked really well together and the pastry was crisp and golden, holding together well in spite of all the meat weighing this pie down! The pastry was in general very good, with a crisp outer crimping and a softer but tasty side and base pastry. 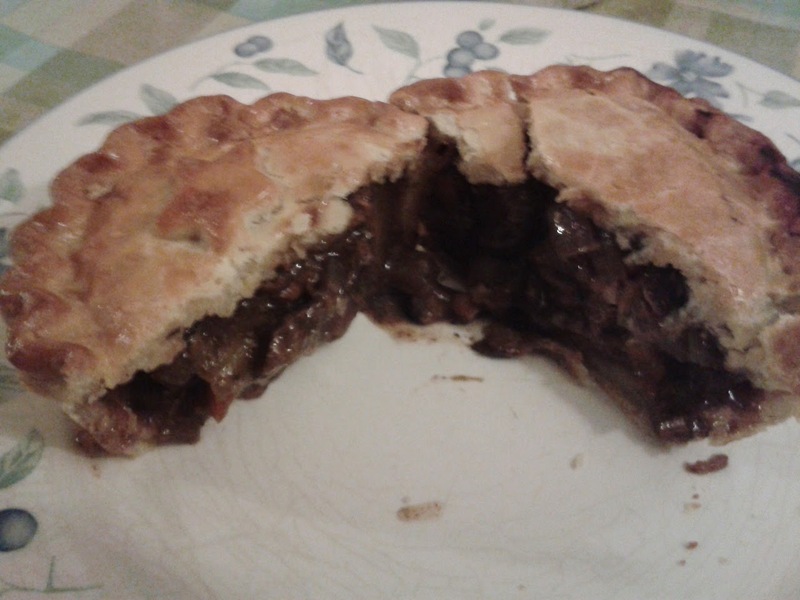 My only minor criticism was I felt there was a tad too much onion for me, but the great volume of meat and well-cooked carrot made it one of my most enjoyable Nice Pies in terms of content and a top-rated venison pie I’d happily eat time and time again! The Cow Pie was again noted for its very good filling:pastry ratio. The meat was so lovely and tender – a real delight. Once again packed in at 70%, there was no missing the meatilicous content of this pie! The beef was quite flavoured with peppercorns though, which for me was slightly over powering for a pie not sold specifically as a peppered steak pie (which is also available in their range). The consistency of the gravy was also runnier in the cow pie than the venison pie and the flavour didn’t excite me quite as much. However these are minor comments and while not quite reaching the stag pie’s status, is still Pierate Recommended. Once again Nice Pie have done us proud, producing more Pierate Recommended pies (including the Highly Recommended Stag Pie!) – and while it’s hard to resist the amazing range of exotic pies Nice Pie do, you would certainly be missing out if you didn’t tuck into a more traditional pie flavour from their range when given the chance!